A monkey styled like Carmen Miranda is just what I need to get some focus at the dinner table. 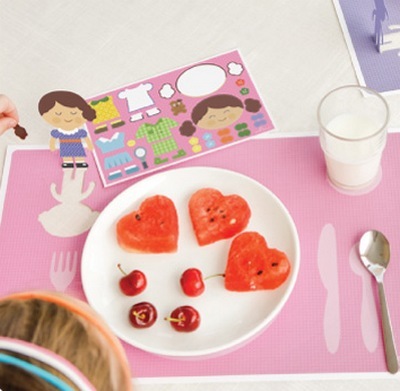 Hello Hanna placemats combine dinnertime fun and a little learning. Kids will know exactly where their spoon, knife and fork should go but it is up to them to customise their robot, turn a monkey into a pirate or dress dolly in her party best. Hello Hanna ‘pop-up’ placemats feature pictures of place settings, a pop-up character and reusable stickers to decorate the placemat. Although a cute idea for everyday use, imagine the fun to be had by party guests if each place was set with Hello Hanna – once the fairy bread is demolished, the placemats will certainly keep little kids happy at the table for a while longer. They’re also be a fantastic idea for the ‘kid’s table’ at ‘grown-up’ events such as weddings. Hello Hanna placemats are $14.95 a set. Each set includes eight placemats and eight sticker sheets. Available directly from Hello Hanna. Stay tuned for more from the Hello Hanna range coming soon.